Edward Hopper’s work is ingrained in American Imagination. They have a paradoxical conflict in the depicting of the ordinary with the desire for a profound vision, with mundane object so simply depicting their geometry they almost become abstract, and the creation of ugly nudes and wooden figures that create compassion. No one is quite sure what about it makes it so influential, but it’s effect on both painting and sculpture is undeniable. What we do know is the mix of juxtaposition of modern styles with traditional work, the incredible arrangement of geometry and the expert use of light playing off of it, the stagelike dramatic presence it has, and the sincerity and clarity of his work makes it so special. One great aspect of his work is its ability to eliminate unnecessary details to get to the heart of a scene. He spent most of his time etching exploring isolated figures, empty streets, the contrast of lights, and the playing of sunlight on architecture. 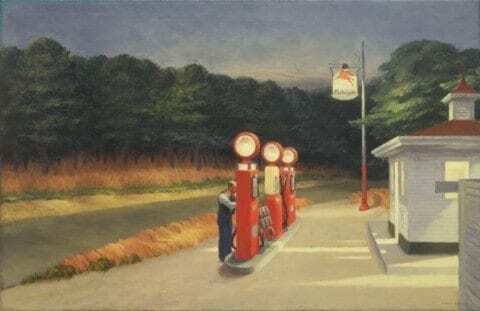 Once he began to explore watercolors, he began painting small-town, rural scenes, and had the ability to use watercolors to create something beautiful from very ordinary architecture. As a realist, he didn’t put any special spin on things, saying he just wanted to pain the truest impressions of nature. He ignored painting the coastline, like everyone else, and instead focused on painting buildings, playing with light off their sides. This gives them a sense of intrigue and mystery. Even while shifting slightly more abstractly, he never let buildings lose their meaning, saying all he wanted to do was paint sunlight on the side of houses. By avoiding filling his scenes with people, he was able to give his cities a disquieting stillness, making the viewer feel uneasy. He did borrow numerous storytelling devices from film, with strong lights, long horizontal shapes, and high contrasts. Hopper’s ability to find beauty in the overlooked, combined with his love of both movies and architecture, and the sense of unease and silence while painting cities, gives his art the ability to be interpreted endlessly. “Edward Hopper Master of Silence.” USA Today, Jan. 2008, p. 34+. Biography in Context, https://link.galegroup.com/apps/doc/A174101237/GPS?u=pioneer&sid=GPS&xid=a7e44db0. Accessed 4 Apr. 2019. Sullivan, Terry. “The indelible influence of Edward Hopper.” American Artist, Nov. 1995, p. 60+. Biography in Context, https://link.galegroup.com/apps/doc/A17550597/GPS?u=pioneer&sid=GPS&xid=0dd5c440. Accessed 4 Apr. 2019. The Great American Artist Edward Hopper (2) by Jacob is licensed under a Creative Commons Attribution-ShareAlike 4.0 International License.